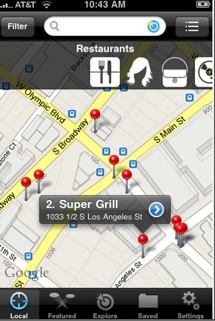 Citysearch Upgrades Its iPhone App With Twitter Reviews And "Shake For Offers"
Over the weekend, Citysearch pushed out an update to its iPhone app with a much smoother user interface, better local search, and maps are now the default view. 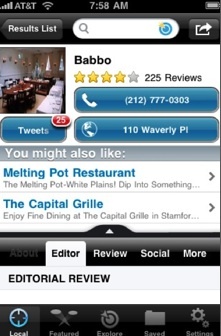 I am happy to report that it no longer looks exactly like Yelp’s iPhone app. The improvements should help it close the gap (Yelp is currently the No. 4 free Travel app, while Citysearch is No. 36). In fact, it now does some things Yelp’s app cannot do, the most important of which is that Twitter is baked into it in a very smart way. Just like on Citysearch’s website, an increasing number of the local listings are associated with what people are saying about those restaurants, bars, and stores on Twitter. 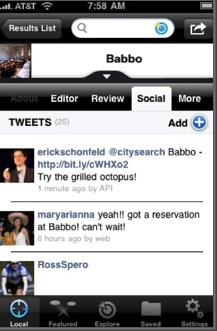 In addition to Citysearch user reviews, you can also see recent Tweets about the listings. And the app acts as a limited Twitter client in that you can Tweet out a short review from each profile page. The app prompts you to sign into your Twitter account and autofills a tweet with a link to the Citysearch page of that business. It is still a work in progress though. Right now the Tweets are filled in with an @citysearch handle and thus don’t show up on the Citysearch’s page for that business. By the next update that will change to the @handle of the business, and it the Tweets will start showing up on the Website as well.